Cash Back Carnival At Party Casino Play Roulette And Get Money Back. 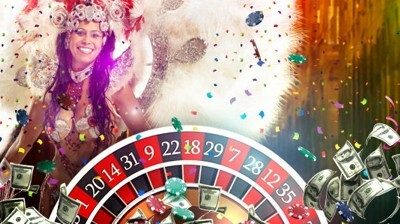 Join The Cash-Back Carnival At Party Casino And Get Money Spent On Roulette Back. The Cash-back Carnival Promotion is in town between the 3rd and 7th June to give you 10% back as a cash bonus worth up to $100.00 if your luck doesn't hold at the roulette wheel at Party Casino. Register for the promotion, play on either American or European roulette wheels at Party online casino and enjoy nothing but good times. Whether you're a roulette pro or fancy giving this casino classic a go for the first time, you can't lose. Party Casino offers 2 types of roulette - American and European. The minimum bet is $1 USD and the maximum is $500 USD. This maximum is a table limit on both table games. American roulette is played with a wheel containing 38 numbered slots (1 to 36, plus a 0 and a 00), in European version you can place bets on one or more numbers on the 37-numbered wheel. The Cash-back Carnival promotion runs from 00.00 ET, 3rd June to 23:59 ET, 7th June. Only Party Casino players who can see the Cash-back Carnival promotion page in their casino account may take part in the promotion. Players need to register for this promotion; you can opt-in at anytime during the promotion. And all the game play from the moment you register for the promotion will count towards the cash-back amount. Only game play on the European or American roulette wheels in the Party casino lobby will count towards the Cash-back Carnival promotion. The cash-back amount will be calculated on the difference between the amount earned and lost between the player registering for the Carnival promotion and the promotion ending. Players that lost more money than they earned at the end of the promotional period will receive 10% back on this balance as a cash bonus, up to a maximum of $100 bonus. Cash-back will be awarded as a cash bonus, but will be displayed in the bonus section of the player's account as an active deposit bonus; no deposit needs to be made towards this bonus. The bonus release restrictions are visible on the bonus page once the bonus has been credited: bonuses will be credited to the players' accounts at Party Casino within 24 hours of the end of the promotion. Boost your gaming account with an extra $/£/€500 bonus (100%) when you sign up to Party Casino today. Loyal players receive extra bonuses every month and take part in various promos, cash draws and contests with live leader boards where they can win sports cars, exotic trips and big cash prizes.